Do we centralize or distribute our analysts? This debate has been going on for a couple of years. There are a whole bunch of articles written about this issue. This isn't uncharted territory. So why jump into the fray? Many of these articles focus on really large organizations. We were curious if we could tap the Mode community to provide insights for earlier-stage companies. How are analytics practitioners starting their teams and subsequently setting analysts up for success as the business and its data needs grow? When we chat with analysts using Mode, many mention that their analytics team is centralized. They're on the hook to create consistent data structures, cohesive practices, and standardized reporting while supporting the entire business. They're laying the foundation for growth, making it easier for more analysts to onboard as the need for analysis increases. 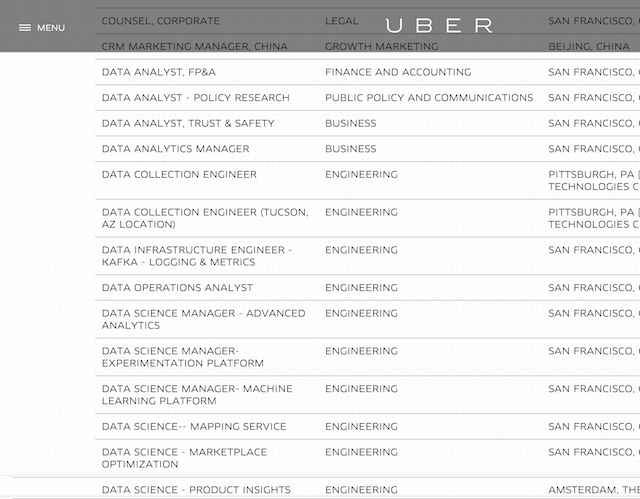 In the Uber case, data analysts are specializing in areas like finance, policy research, and safety, or being distributed to international markets. These “satellite teams” can build up domain knowledge that provides context for their analysis, leveraging the rock-solid foundation the centralized analytics team has put in place. Regardless of business size or structure, there might be an alternative that provides the best of both worlds: fluid movement between a centralized and distributed team. In her recent article “Where Successful Data Scientists Sit,” Clare Corthell recommends the “pulmonary model,” in which data scientists move back and forth every few months, or throughout the week. The value here is that folks can build up domain expertise in specific areas of the business, while also working with other analysts to maintain consistent methodologies. To check out what's going on at a few fast-growing companies with centralized analytics teams, we brought together three Mode customers to get their perspectives. Eyal Eldar is one of two analysts at Magisto. Miju Han leads the analytics team at TuneIn. And Matt Isanuk is over at Thumbtack where they're quickly scaling their analytics team. It turns out there were a few themes across companies. Thumbtack has reached the point where departments need dedicated analytics resources (it's the largest company we spoke to for this blog post). However, while an analyst might specialize in the needs of another department, she still reports into the centralized analytics team. While there are exceptions, the centralized analytics team most often reports into product. In tech, this makes sense. Our products are core to our businesses—and it's our products that generate the bulk of our data. When data folks report into product, they're well positioned to provide context for high-impact decisions. For the folks we talked to, supporting other departments while reporting into product works. As the requests from marketing, finance, operations, et al. grow, analysts are able to leverage their knowledge of the foundational data structures and methodologies to more quickly deliver answers out to other teams. How are your analytics initiatives shaping up for 2016? Take a quick survey to let us know. We'll gather the responses and publish the ideas and trends to ring in the New Year.